A reparative hand cream for extremely dry, rough hands. Specifically formulated for very dry, rough and cracked hands. 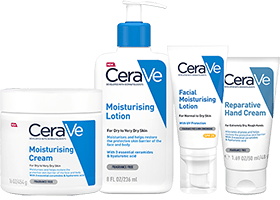 CeraVe Reparative Hand Cream is a non-greasy formula that deeply moisturises dry, cracked hands and helps protect the skin barrier. With 3 ceramides & hyaluronic acid this cream helps support the skin barrier and retain moisture. Long lasting hydration for up to 24 hours. Suitable for children and adults. 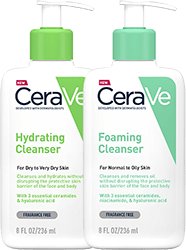 A moisturising cleansing lotion for normal to dry skin with 3 essential ceramides to help protect skin’s natural barrier. A lightweight moisturising body lotion that provides 24-hour hydration with 3 essential ceramides to help protect skin’s natural barrier.